It’s time to talk about mental illness – for real. Bell Let’s Talk Day gets considerable airtime every year, but many believe the company isn’t putting their money where their mouth is. Bell’s annual Let’s Talk Day (LTD) is widely lauded for the awareness and funds it raises in support of mental illness. According to their website, “Bell Let’s Talk promotes awareness and action with a strategy built on four key pillars: fighting the stigma, improving access to care, supporting world-class research and leading by example in workplace mental health.” However, I question how effective the Bell Let’s Talk campaign really is. On Let’s Talk Day, Bell encourages people to post supportive messages to create understanding and reduce stigma surrounding mental health. To some extent, LTD is successful in that. In my own experience, I’ve only discovered that certain people I know can be trusted with information about my mental illnesses because of their LTD posts. Through those posts, the event has helped to reduce my own fear of stigma. On the flip side, I can’t think of a single time that LTD helped me realize or challenge prejudices I held about other mental illnesses. The main focus of LTD’s awareness campaign is on anxiety and depression, which are hellish, serious illnesses and the increased understanding LTD helps foster is absolutely beneficial to those of us who deal with them. But there’s a reason that those are what LTD chooses to focus on: they’re not the “scary” mental illnesses. LTD does very little to address the stigma faced by people with schizophrenia, borderline personality disorder or any other mental illness that’s not so palatable or easily understood. For instance, on the Bell Let’s Talk website, there are 49 personal stories from people who act as the public faces of the campaign. Of those 49 stories, only two are from people with a psychotic disorder. By failing to shed light on a wider spectrum of mental illness, Bell Let’s Talk presents a sanitized and incomplete perspective of what mental illness as a whole actually looks like. For people whose information about mental illness largely comes from LTD, this omission of psychotic disorders, personality disorders and other “difficult” mental illnesses leaves them with a skewed perception of what “mental illness” means. On top of not actually creating awareness for a comprehensive, inclusive range of mental illnesses, the ways in which LTD does create awareness are problematic. Those 49 stories perpetuate and conform to ideas about the nature of mental illness that are unhelpful and even harmful. Many of the stories follow “overcoming” narratives about how these mentally ill people are able to live good lives despite their mental illnesses – but only after they have recovered from them. Beyond making me feel bad by implying that I can’t do anything with my life until and unless I fully recover from my mental illnesses, this attitude reinforces the idea that “success” for a disabled person means being productive. There is also the implication that a “cure” is a realistic expectation, so long as a person just tries hard enough and seeks the right treatment. This is not the reality for many people, and these attitudes can lead to unnecessary guilt and victim-blaming. Another component of the Let’s Talk Day is money – let’s look at that! LTD’s main gimmick is that Bell Canada will donate five cents to Canadian mental health programs for every text or call made on their network and for every Tweet, Snapchat, Instagram post or Facebook post made with the #BellLetsTalk hashtag. Although this is presented as a kind of fundraising effort, the money is not actually generated by participation – Bell already has the funds and could simply donate the money without the additional cost of creating and circulating promotional materials. 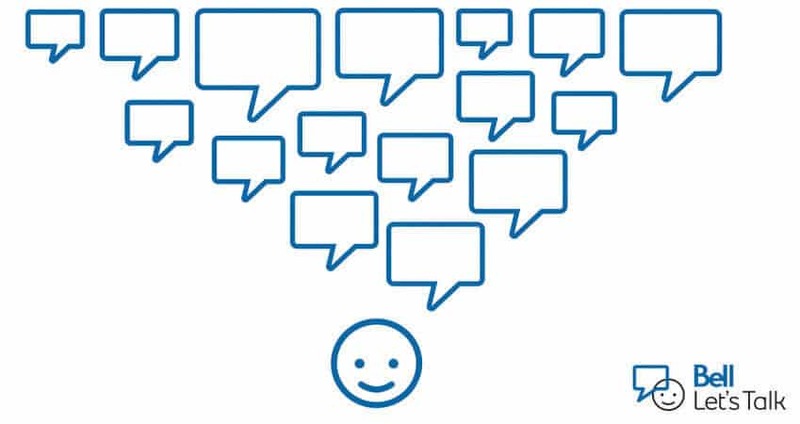 The first question this raises for me is, “Why does Bell only donate when people participate?” It’s ostensibly part of the awareness campaign, but the fact of the matter is that every time someone uses the #BellLetsTalk hashtag, the awareness raised is awareness of mental health and of Bell in equal measures, which is far from incidental. What’s more, LTD increases awareness of Bell not only as a brand, but also as a “good” brand that cares about important causes. There’s also the question of where Bell’s donations go. Since only registered Canadian charities are eligible to receive money from the Bell Let’s Talk fund, all those five-cent donations add up to significant tax deduction for the company, allowing Bell to pay even less than it already does toward public infrastructure, including mental health services. In turn, this creates a greater reliance on private sector services and charities such as Bell Let’s Talk itself. Bell Let’s Talk is just one part of the wider system. It both helps mentally ill folks (by fostering increased awareness) and hurts them (by reinforcing harmful ideas). It both supports mental health care (by providing funding) and undermines it (by encouraging reliance on charity rather than strong public services). My point here is not to criticize people who align their mental health activism with Bell Let’s Talk or to undermine the good work those people do. My hope is to encourage readers to think critically about ad campaigns masquerading as social activism and consider how you can most effectively channel your time, effort and resources in creating meaningful change. Charlotte Savage, copy editor at the Argosy, fills her days with microwaveable foods, young adult fantasy novels, and poor time management. She is currently wandering toward a degree in modern languages.